We’d love your help. 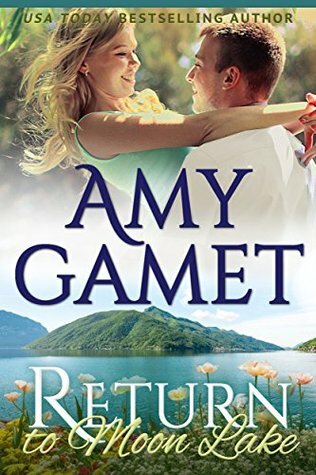 Let us know what’s wrong with this preview of Return to Moon Lake by Amy Gamet. Nothing could get Lisa Addario to come back to Moon Lake like a deathbed invitation from her estranged mother. But Lisa’s walk down memory lane turns into a fight to keep the house she grew up in and a deeper struggle to live down her own mistakes. Army Lieutenant Greg Mora can’t forgive himself for killing his best friend in combat. Two months after finishing his tour in Nothing could get Lisa Addario to come back to Moon Lake like a deathbed invitation from her estranged mother. But Lisa’s walk down memory lane turns into a fight to keep the house she grew up in and a deeper struggle to live down her own mistakes. Army Lieutenant Greg Mora can’t forgive himself for killing his best friend in combat. Two months after finishing his tour in Afghanistan, he left town in a traumatic stress-induced haze, ending his relationship with Lisa’s sister Melanie. To ask other readers questions about Return to Moon Lake, please sign up. Greg Mora is haunted by the past, by a war that changed his whole life. And by the death of a friend. When he returned to Moon Lake , it was as a man who had given up on all of his dreams for a future as a doctor, a husband, a father. Lisa Addaria has always felt no one understood her. No one that is except her Father, who is now gone. When she left Moon Lake for the big city, it was to find a new life, but it was also to get as far away from home as possible. But now her life is calling her back Greg Mora is haunted by the past, by a war that changed his whole life. And by the death of a friend. When he returned to Moon Lake , it was as a man who had given up on all of his dreams for a future as a doctor, a husband, a father. Lisa Addaria has always felt no one understood her. No one that is except her Father, who is now gone. When she left Moon Lake for the big city, it was to find a new life, but it was also to get as far away from home as possible. But now her life is calling her back home. Her Mother is in critical health and Lisa needs to sees her. What Lisa doesn’t expect is to run into Greg Mora, her sister’s ex-boyfriend. Or at least she didn’t expect to run into his truck. Blinded by the torrential rain storm, she hits Greg’s new truck, which is parked in front of her family’s home. And even more surprising is to see the man demolishing the bathroom inside said home. Greg, it seems, has given up on his dreams of becoming a doctor, and traded them in for a tool belt. Greg is still the handsome man Lisa remembered; only now he is carrying around the emotional scars from the war. And Lisa is still the kid sister of his former girlfriend; now a beautiful woman who still can catch is eye. But can two broken people see into each other’s souls and help heal the wounds that have been open for far too long? What Lisa and Greg don’t know is that there is a Cupid in the form of Lisa’s Mother, trying to put the two of them together. This story brought tears to my eyes. It was touching, loving and beautifully told. Lisa Addario left Moon Lake and never really looked back either. But does that mean she doesn't have any regrets? That's a resounding no way in hell. When Lisa gets a phone call from her mother asking her to come home. She does in a heartbeat but nothing goes as planned either. Greg Mora isn't the same man he used to be but nobody around him can accept this no matter what he says. Greg running into Lisa Addario is the last thing he needs but can't deny his attraction to her either. Lisa's homeco Lisa Addario left Moon Lake and never really looked back either. But does that mean she doesn't have any regrets? That's a resounding no way in hell. When Lisa gets a phone call from her mother asking her to come home. She does in a heartbeat but nothing goes as planned either. Greg Mora isn't the same man he used to be but nobody around him can accept this no matter what he says. Greg running into Lisa Addario is the last thing he needs but can't deny his attraction to her either. Lisa's homecoming is anything but welcoming. Lisa's hoping to mend some of her broken bridges and move forward with her life. Will any of this happen? Will Lisa admit her attraction to Greg? Will Greg let Lisa in? Your answers await you in Return to Moon Lake. I was on an emotional roller coaster reading this book. My heart broke for all the hurt Greg was going through, and the demons he is facing. He is an alpha type hero, and being one of course he is a bit stubborn. It was great to see Lisa draw him out of his shell, even when they seem to have a love/hate relationship half the time. They both grew so much in this book, and they supported each other as they faced their individual demons. There was one previous heroine who sort of irked me with some I was on an emotional roller coaster reading this book. My heart broke for all the hurt Greg was going through, and the demons he is facing. He is an alpha type hero, and being one of course he is a bit stubborn. It was great to see Lisa draw him out of his shell, even when they seem to have a love/hate relationship half the time. They both grew so much in this book, and they supported each other as they faced their individual demons. There was one previous heroine who sort of irked me with some of her actions, but luckily she redeemed herself nicely. A book I could not put down! I picked it up at 11pm thinking I would read a bit then sleep. I could not go to sleep till I finished the book because I had to find out what happened to Lisa and Greg! Moon Lake is a lovely community and a place both Lisa and Greg have returned to for their own reasons. Their story, of two people who feel broken but can see the positive in one another, is the type I like to read because it gives me this warm feeling inside that makes me believe there is a happily ev A book I could not put down! I picked it up at 11pm thinking I would read a bit then sleep. I could not go to sleep till I finished the book because I had to find out what happened to Lisa and Greg! Moon Lake is a lovely community and a place both Lisa and Greg have returned to for their own reasons. Their story, of two people who feel broken but can see the positive in one another, is the type I like to read because it gives me this warm feeling inside that makes me believe there is a happily ever after for everyone…no matter what their lives have been like in the past or what they have lived through. Thank you to the author for the copy of this book to read and review. This book #3 in a series. I received the audio version in exchange for an honest review. I really enjoyed this story. The characters are very well-developed. The relationships are interesting and realistic, and the story is believable. The writing is very good, and the story flows really well, with lots of action and dialogue. I liked the first book the best, only because this one and book #2 are a little darker in their subject matter. Looking forward to reading the others in the series. I loved this book, as much as I have loved all the rest in the series. Ms. Games has a way of writing that just pulls you in and keeps you reading. Her characters are always so realistic that you actually feel for them. Greg and Lisa are made for each other, but each ha so much baggage to lose before any kind of HEA can be achieved. Buy this you will love it --- especially if you liked the others in this series. The last book in the series of three, Return to Moon Lake, made me want more books in the series. Each book is a stand-alone book, but its nice to have them all to read in order. The characters in this book are well rounded with a spirit of joy. The narrator, Eva Kaminsky, does a beautiful job and makes listening fun! Amy Gamet and Evea Kaminsky are quite a team! Amy Gamet is the USA Today bestselling author of romantic suspense and contemporary romance. She's best known for her HERO Force series, where military romance meets thrilling action and intrigue. Book 7: Kidnapped by the Amy Gamet is the USA Today bestselling author of romantic suspense and contemporary romance. She's best known for her HERO Force series, where military romance meets thrilling action and intrigue. All books can stand alone except for Forever with the SEAL, which features the couple from Stranded with the SEAL in a wedding novella. Love and Danger - Books should be read in order. Love on the Lake - Books should be read in order.